This card is one that got so many requests on Instagram that I relented…lol! I’ve done water a lot, but not with an icy landscape above, so here we go with that – also, I made it a little differently than the original card, with different colors and with more of a Valentines theme. Love stamp sets that can do multiple seasons! Watch the video below or click HERE to see it in HD on YouTube. And out of curiosity, I wondered what a group of otters is called – and unironically…it’s called a “raft”!!! I bet if they were all floating on the surface together that’s what they’d look like, eh? Here’s the original card from Instagram….with floating candy canes! I like to support charities that make a difference in areas I’m interested in. One, of course, is the Otter Project! I absolutely loved my trip to the Monterey area last year and seeing the otters – and this org protects them and educates us about how we can help. Donate here. 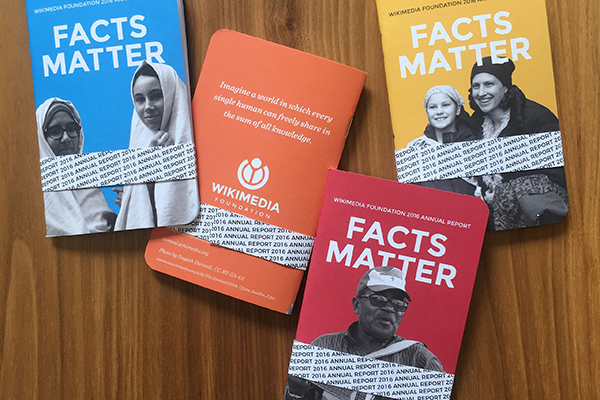 The other that I donated to today is Wikimedia Foundation – the nonprofit behind Wikipedia! I used them to find out about the otter raft….and that’s when I was reminded that at this time of year I give them some money because I look things up on their site all. year. long! They also publish a yearly If you can remember the last couple things you found on Wiki, go give them at least a couple bucks! Two awesome cards, love them both! Thank you for today! How adorable is that little otter ! I love all the bubbles around him. What a pre lous scene, oh my goodness. Love this. Love your underwater scenes – and have had some luck with them, which makes me want to make more – looks like I’ll need another tiny stamp set! Great cause—the Monterey otter world exhibit in 2008 was fantastic! Love your card, too. Facts do matter, esp in these times. 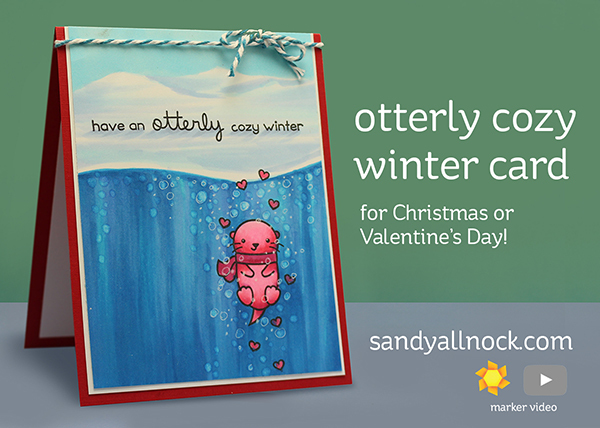 beautiful card Sandy, love these little otters. I volunteer for MARS Wildlife Rescue on Vancouver Island and we occassionally get these in but they get transferred to the Vancouver Aquarium as soon as they are stabilized. Right now we have 3 river otters in and have had them since spring. They live in their pen called “Otterwa” and will be released this coming spring. I can’t afford to give money but do lots of fundraising for this group! Wonderful scene and love both versions of the card. cute images and love cascade mountain range. Sweet. I love the two versions of your card ! 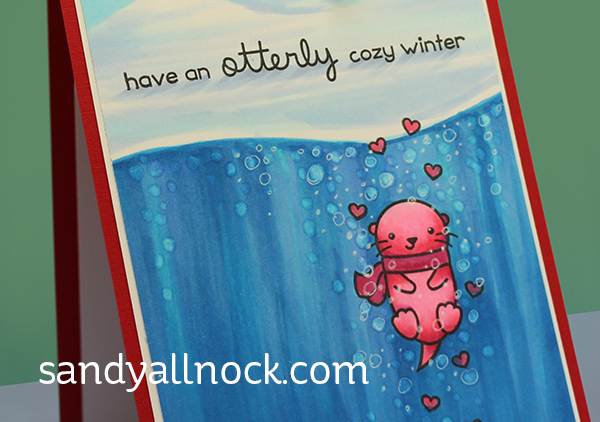 Otters are so cute, they are a perfect subject to brighten the day of the person who will receive the card. There are marine otters and river otters. (There may be other varieties as well.) Some live in the ocean, but the ones I have seen are inland frolicking on the beautiful rivers of Idaho! They are quite enjoyable to watch, but not often seen. So cute! Love that this set is versatile. The otters are adorable & you gave me a lesson on otters today too! OMG! Squeeeeeeee! I LOVE these otter cards! The water looks so beautiful and seeing those bright peppermint sticks in the water makes me squeal with joy! I SO love your bright colorful style! Masterful! I feel cold,after watching that scene come together. Great card.